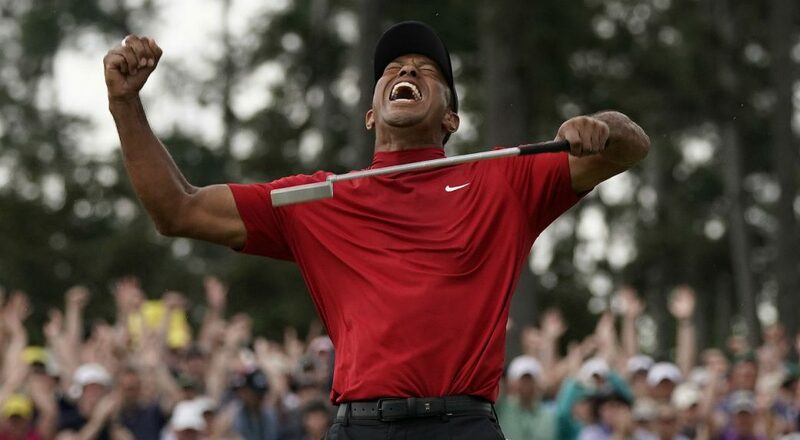 2019 Masters on Sunday, his first triumph in one of golf's four noteworthy competitions in over 10 years. Woods energized fans as he pulled ahead during the Masters’ fourth round in Augusta, Georgia. He entered the final day tied for second place, two shots behind Francesco Molinari. By the 18th hole, he held a two-shot lead. With that cushion, he bogeyed the last hole to shoot a two-under-par 70 on Sunday, winning the tournament with a score of 13 under par. Three players finished a stroke behind him. Woods’ triumph marked his fifth Masters title; he previously won the green jacket awarded its victor in 1997, 2001, 2002, and 2005. Sunday’s win also was the first time he had won any major without holding at least a share of the lead going into the final round.